Carsome came onto the startup scene not too long ago and were already set to become revolutionary right from the get-go. That was because they were one of the Malaysian pioneers in providing a proper curation site for different brands of cars from various dealers. It has been a year since we last spoke to the Carsome team and they have once again managed to turn the wheel and are now entering the used car market field. 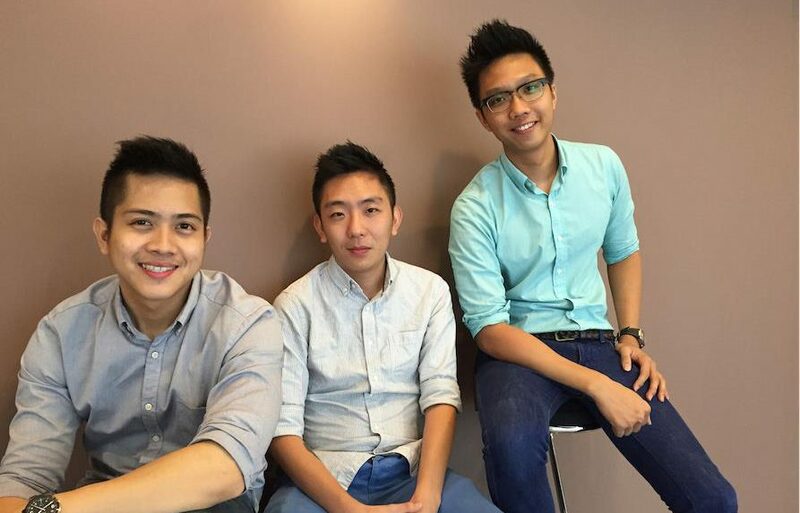 Vulcan Post decided to check in with Eric Cheng of Carsome, as he shares what the startup has been up to, and most importantly how much they have grown within the span of a year. 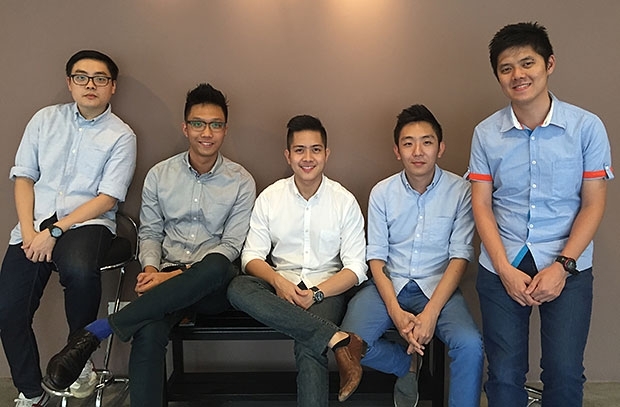 Q: How is Carsome’s experience thus far, in venturing into the used car market field? A: The company’s core business now is to provide a hassle free experience for consumers who wants to sell their pre-loved cars to the dealers nationwide through a transparent bidding system. The introduction of our proprietary pricing data based on real transactions was the key to the company’s growth. Used cars prices vary widely, and the market value for used cars was difficult to assess. 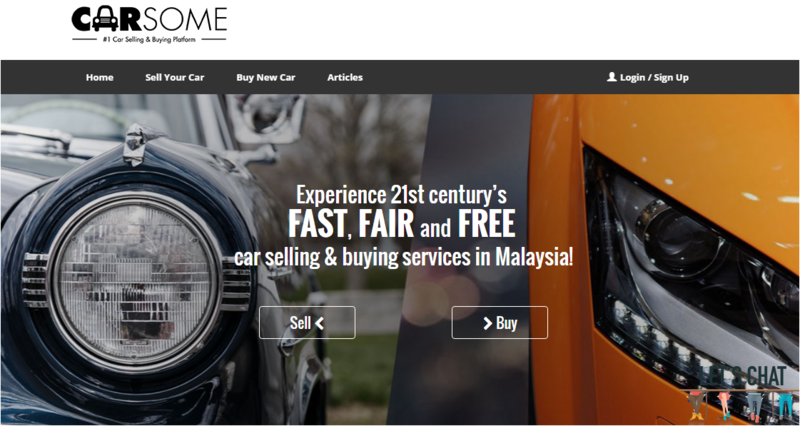 Carsome was the first and only one to introduce online valuation of your car and provide 162-points car inspection to put up on our online bidding system for over 200 dealers across Malaysia to determine the best price for your car. 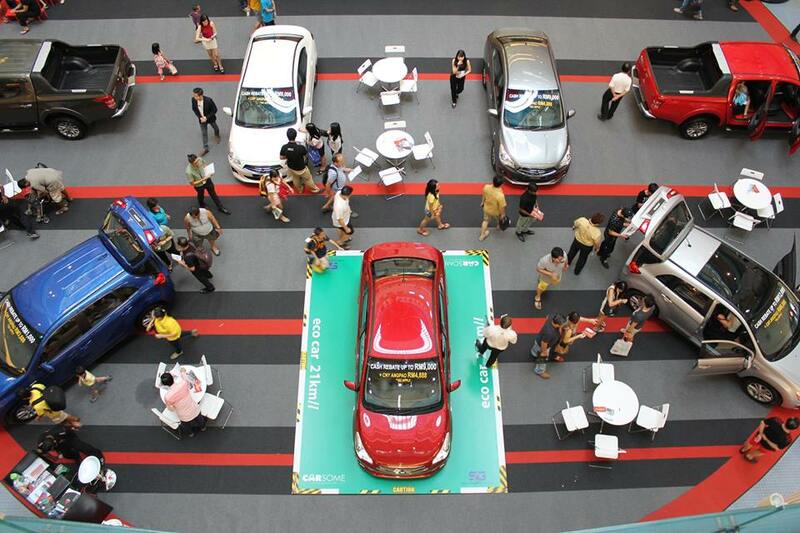 Within a year from being set up, Carsome is already one of Malaysia’s largest buyer of used vehicles. Q: Would you say that this is a form of pivoting for Carsome? A: Carsome started as a price comparison platform that enables users to received offers and make a well informed decision. But we immediately felt the need in helping our users to get rid of their used cars. Traditionally, there were 2 ways a car owner could sell a car. They had the choice of trade-in when buying a new car from new car dealer, or selling directly to a used car dealer. Both of these methods offered no clear price transparency as well as wide discrepancy among individual dealers. Spotting this opportunity, we added the car selling service with our inspection service, transparent bidding system and made purchase prices transparent. This allows us to deliver more value to our customers instead of just price comparison. Through the buying service we offered initially, we managed to get closer to figure out what customer really needed and pivoted from there. 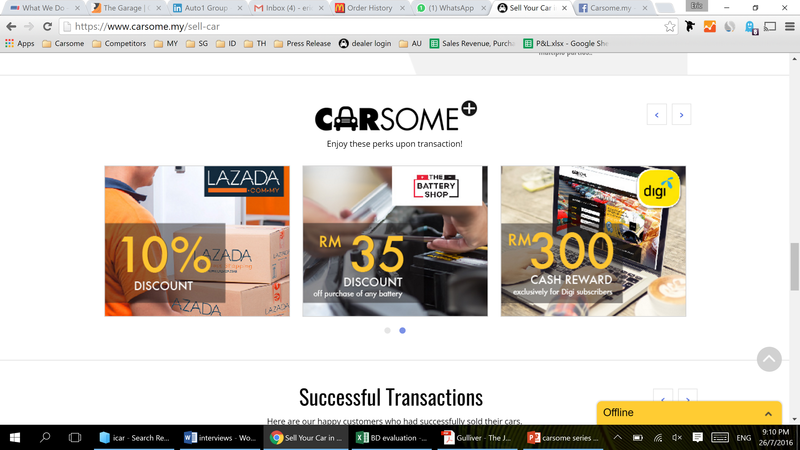 Q: How many Malaysian users does Carsome have as of now? A: On average, we have 200k users come to our platform to buy and sell cars. Q: What makes you believe in your business model even after all this while? A: Carsome is solving a real pain point in the market, where we tackle the pricing issue everyone faces when selling their used cars. We set our standard prices by allowing dealers across the nation to determine the best competitive price in the online bidding system. Best of all, we take care of everything else from car inspection, ownership transfer to instant payment, which usually have to be taken care of by the car sellers. Q: What are the struggles in supporting the team, considering at one point, the founders were paying their employees out of their own savings? A: The team size now (72) and then (4) within a year was a big difference and company culture has becoming an important thing to practice. I always use a hands on approach to ensure tasks are executed the right way and more importantly every team’s direction are aligned. But by doing this I would need to be careful in balancing my approach to not micro manage too much which might affect the creativity of the employees. Q: Is Carsome growing in terms of revenue, and are you guys breaking even each month? A: We are experiencing exponential growth in our revenue since the start of 2016 and our compounded monthly growth rate is at 62%. Our numbers now are showcasing our strength in achieving market leader position in this segment by end of this year, which would mean a lot to us considering all the hard work we have poured in to the business. As we continue to expand our footprint (we are now in MY, SG, ID & TH), we are more heavily focus to ensure we capture more market share in the next 12 months. Q: What challenges still exist in the market for Carsome? A: To the new markets we have just penetrated like Indonesia and Thailand, it is almost equivalent to starting a new startup especially when talking to the dealers, which we would spend a lot of time in educating them the convenience of our bidding platform. Often times we refer ourselves as the “Amazon for Car Dealers” to help them understand better that we are a platform where they can get exclusive access to inspected cars every day. Q: When we last spoke in August of last year, Carsome had over 100 dealerships on deck. How has that expanded thus far? 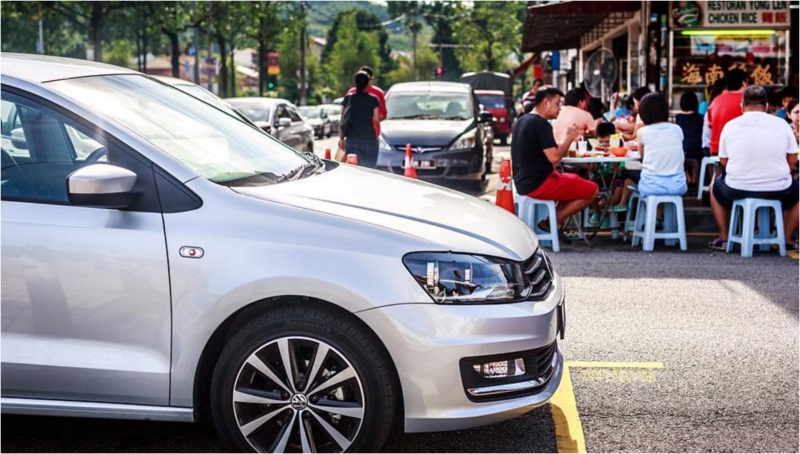 A: Within Malaysia we have now over 200 dealers working with us. Regionally we have more than 500 dealers in our network. By end of the year, we are expected to be working with 1,000 dealers in SEA. Q: What are the hardships in expanding to Singapore, Indonesia, Australia and Thailand? A: It is always about localisation when it comes to a new market. Every country has a different culture, environment and way of doing things. In order to succeed in a new environment, understanding local consumer preferences and other locale-specific requirements is key while still providing the same value proposition to the consumers. Q: Where is Carsome looking to expand to next, and is SEA in the cards? A: We are looking to add more markets in SEA to benefit more consumers while strengthening our footprints in the markets we are already in. Definitely you will see more movement from us in the next 12 months. Q: How was the USD 2 million Series A funding obtained some time back utilised to grow your startup? 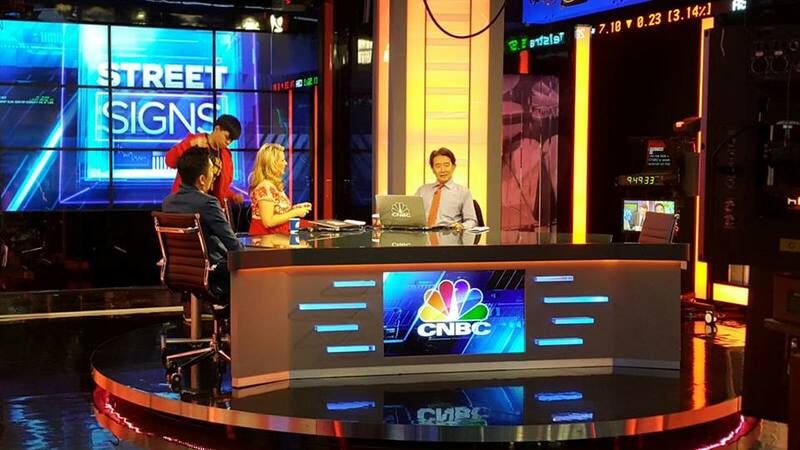 A: It was great having that additional funds to further fuel our growth and we have thus far overachieved all our milestones which also increased our existing investors’ confidence in Carsome. I’m glad we could repay our investor’s belief in us with our effort ever since the A round we raised. Q: What other automobile partnerships have you guys made thus far, and what are some more that users can look forward to? A: Instead of only working with the automotive brands, we are currently striking collaboration with banks, financiers, insurance companies and even startups in the region to further add values to our range of services. Part of our initiatives launched was our recent Carsome+, a reward programme that entitled our users to enjoy perks from partners like Digi, Lazada, BatteryShop etc.